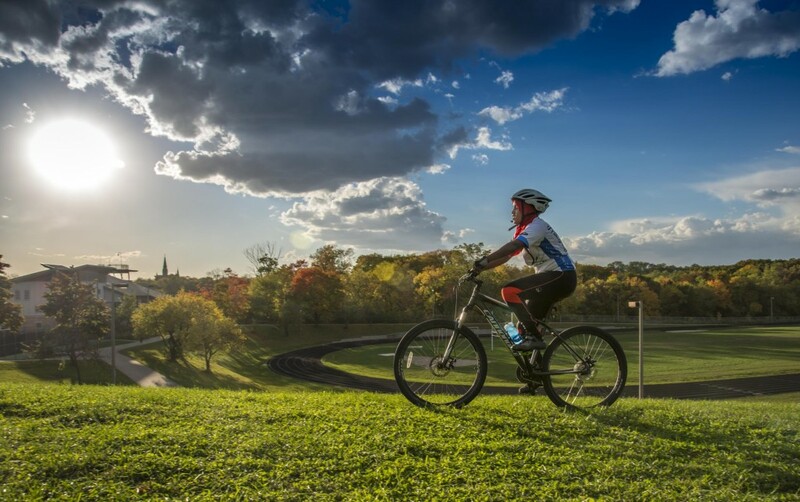 A Milwaukee High School Mountain Bike Team member personifies the spirit of biking. Hodan practicing on the track behind Riverside University High School. 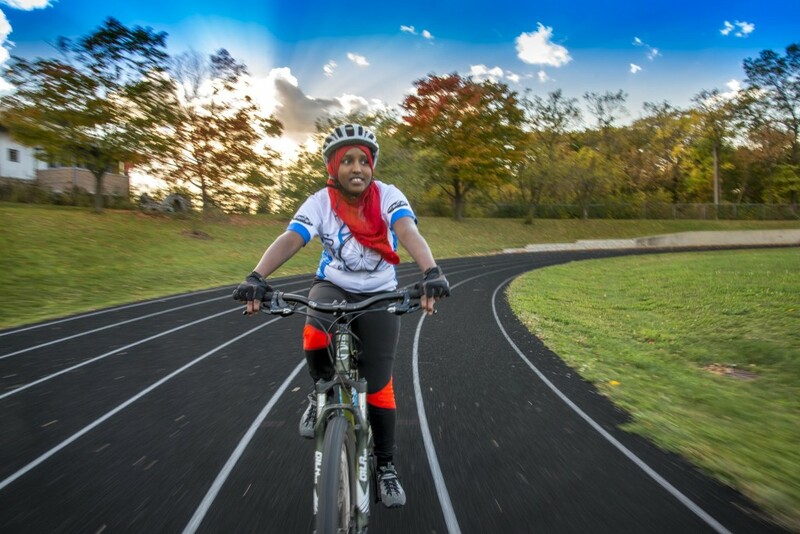 A few weeks ago I went to photograph the Milwaukee High School Mountain Bike Team practice and had the pleasure of meeting an inspiring teen, Hodan Mohamud, 16, the only female student on the team at Riverside University High School. Hodan came to the mountain bike practice directly from swim practice after school. Beyond her infectious smile and impressive work ethic, Hodan demonstrated she is a quick learner, mastering clipless pedals in the 30 minutes she was in practice that day. While I was there to photograph the whole team, I specifically wanted to meet Hodan because I had heard so much about her from Bill Koch, a member of the Bike Fed’s Board of Directors who has volunteered his time to help launch Milwaukee Public Schools’ high school mountain bike program with Paul Zettel, a teacher at Riverside. Bill had told me that although Hodan finished dead last in her first two races, she kept a smile on her face and kept cheering loudly for her male peers in their respective races. “And get this,” Bill added, “one day they were riding on the Oak Leaf Trail and she stopped to move a Wooly Bear caterpillar off the trail to safety!” Since I have done the same thing a number of times on my way to work on the Hank Aaron State Trail, I knew I had to know more about this kid. How did your last race go? How did you hear about high school mountain biking team? “During my freshman year I joined the school triathlon team, which involves swimming, cycling, and running. I had no problem with swimming since I was in the girls swim team in the fall. Also swimming was a sport that was common in my family. As a kid, running and biking were something that I loved doing. For running, I always used to compete against kids when it was recess time. I like biking because it gives me freedom. I would bike to the park with my siblings for three hours and then come back home. I didn’t technically stop biking and running when I got to middle school, but I put biking on the side so I could focus on going into high school. When I got to high school I started to practice running and biking as part of the triathlon team. It was pretty tough because I wasn’t in shape. My coaches, Paul and Eli, saw that I was struggling with those two, so they told me to join the Riverside biking club Tuesdays and Thursday and that is when I found Riverside high school had a mountain biking club. I started to attend mountain biking club more often and began to build my endurance up. Do you have a mountain bike of your own at home? What do you like about the high school mountain bike racing? Elizabeth Bart, who volunteers to help coach the mountain bike team and the triathlon team has been similarly inspired by Hodan. Hill practice on the grass behind Riverside University High. Thanks to the volunteers and teachers at Riverside University High School for inviting me to their practice. Thanks to Hodan for being so open with her answers to my questions. Thanks to Tristan Klein from Coast In Bikes and iSSi for help with the clipless pedals. And of course, thanks to the organizers and sponsors of the Wisconsin High School Cycling League. I will end this post by saying that Hodan and the rest of the kids at that practice inspired me to work to improve mountain bike access in Milwaukee so they have real trails to practice on. Be sure to check back tomorrow for the follow up post about how we are proposing to improve the access to Milwaukee’s mountain bike trails for the kids in the Milwaukee team and the Shorewood High School Mountain Bike Team too.